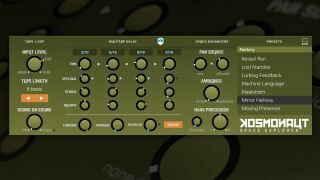 Promising ‘plenty of space’, Bram Bos’s Kosmonaut is a multitap delay Audio Unit for iOS that comes with a few extra tricks up its digital sleeve. Features include a tape looper with variable sound-on-sound decay level, a 4-tap delay, low-pass/high-pass filters with LFO, an auto-panner and an ambience generator. There’s also a Haas Effect processor. All of these features are demonstrated in the factory presets, and you can save your own (these will be available whichever AU host you’re currently using). Tempo is automatically synced to host, and you can use the Random feature for instant inspiration. Kosmonaut is available now from the Apple App Store priced at $3.99.